We bring a very original game since it is a game of dressing girls for an Arab wedding. The fashion in this type of clothing varies a bit to what we are used to and that is what makes this game special. We will know all kinds of Arab clothes for these events and we will learn to combine them according to our tastes. We will choose a nice hairstyle for the bride and then you have to choose more classic dresses or other totally innovative for our vision. Also choose the accessories, the veil, the shoes and even the skin color of the protagonist. Prepare the Arab girl for the most important day of her life and always remember her great wedding. 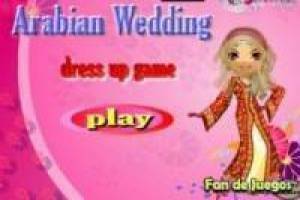 Enjoy the game Dress up for an Arab wedding, it's free, it's one of our wedding games we've selected. Ellie: The Furious Bride Dress up Guillermo and Kate Color your wedding Dogs Wedding Dress Up Wedding dresses 2 Ver. 2 Frozen, elsa`s wedding Make up for wedding Weddings: Perfect Make up The wedding of anna and kristoff Barbie and Ken get married!! Hairstyles for wedding Can you kiss the bride now?